SOS Children's Villages has been working in the Central African Republic since the early 1990s, when it started supporting families and children in the capital city of Bangui. The country remains one of the poorest in Africa, and the lives of children have been blighted by years of political unrest and violence. An increasing number of children lose parental care Children from the SOS Children's Village in Bangui (photo: SOS archives) Bangui is the country's only large town and home to over 700,000 inhabitants. The town is located on the banks of the Oubangui River. The SOS Children's Village is based about six kilometres away from the centre of Bangui, in the Gbangouma district. 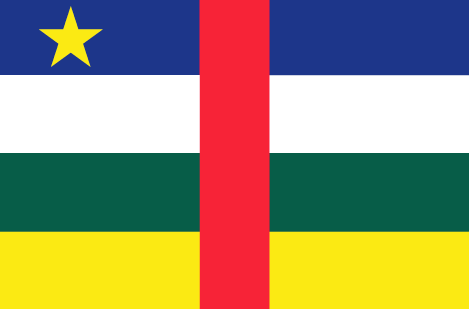 Bangui is the administrative and commercial centre of the Central African Republic. The country continues to exist off agriculture, and the majority of the population around the capital city lives off farming. The high incidence of HIV/AIDS, the unstable political climate which has displaced many people and the high unemployment rate put a lot of strain on families. An estimated 3,000 children can be found on the streets of Bangui - some of these are found begging or trying to make some money by doing menial jobs. Others live on the streets because they have nowhere else to go. The majority do not go to school, and it is difficult for them to get medical treatment when they need it. A pressing need to provide children with loving homes SOS Children's Villages became active in the Central African Republic after the country's authorities approached us: the government wanted us to work with children who had lost parental care. A feasibility study confirmed the urgent need to provide families and children with material support, access to education and to give them medical care, both preventative and curative. Our programmes have since adapted and developed according to the needs of the local population. The work of our organisation has also been affected by the political unrest; we have worked very hard to support the local community and ensure that the children in our care are safe. SOS Children's Villages works closely with the families in the neighbourhood: it aims to support these families so that they can stay together and their children are not forced to work on the streets but can rather attend school. The SOS Family Strengthening Programme acts in collaboration with local agencies to ensure that children have access to essential educational, health and nutritional services. We also provide counselling on parenting skills and income generating activities. We strengthen the support systems in the community so that families have someone to turn to when they need help. In an area where the HIV/AIDS rate is so high, the provision of counselling and psychological support for people affected by the disease is one of our priorities. Through the SOS Medical Centre, we provide medical advice and treatment to about 1,000 patients a month. Children who have lost parental care can find a loving home in one of the eleven SOS families, where up to 110 children can be looked after. The children grow up with an SOS mother in a familial environment full of love, respect and security. Young children can attend the SOS Kindergarten, which has capacity to care for up to 125 children, some of whom come from the neighbouring community. The provision of day-care is particularly valued by those parents who attend training or go to work. Older children go to the SOS Hermann Gmeiner School, where up to 480 pupils can receive a primary education. Young people who are ready to leave their SOS families move into our youth programmes, which can accommodate up to 80 young men and women. With the support of qualified professionals, they are guided through this new stage of their lives, as they start vocational training courses, attend higher education and start looking for work.